Betta fish, also called Siamese fighting fish are one of the most popular types of fish found in homes across the world. Their vibrant colour and active lifestyle seems to draw in fish fanatics as well as those who have never had fish before. Betta’s are relatively easy to care for and their low maintenance is particularly appealing to people who would like to have fish but don’t have a lot of time to care for them. Once you bring your Betta’s home you should begin to familiarize yourself with their movements and typical behaviour patterns. When you look at your fish after you’ve had them for awhile you’ll know if something is wrong, if they are not feeling well, or if the water in their bowl is not in the best condition simply by being observant. Make sure the jar or bowl that you keep your Betta in is big enough so that he can swim around and not bump or tear his fins or scales. Also be sure there is plenty of surface area so that he can get enough oxygen. Your Betta will thrive in the cleanest water that you can provide for him. He does not require a filtration system, but you should change out a third of his water every three days so it stays fresh and clean and keeps your finned friend from getting bacterial or fungal infections. Aged water (water that has set out for twenty four hours) is what should be used to replace the old water. 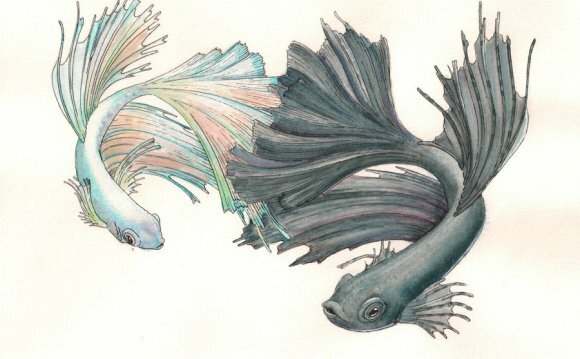 Do not put your Betta fish with other Betta’s. They are called Siamese fighting fish because they are, in fact, fighting fish. They will tear at one another, often causing the death of at least one fish before they stop. Betta’s can be coupled with algae eaters, guppies, or corydorus catfish safely. Use a turkey baster to clean small particles of uneaten food or debris from the bottom of the bowl or jar. Allowing this debris to sit at the bottom of the jar will cause the water to become cloudy, unsanitary, and to smell awful. The PH of your tank should be at exactly 7.0. You can get a PH testing kit at your pet store along with solutions to minimize or increase the PH of your water. When you clean the plants, rocks, or decorations in the bowl you should never use soap on them. It’s very hard to completely rinse all soap from these items and the soap residue can harm or even kill your Betta. Instead, use warm water and an abrasive brush to clean his things. Keep your Betta tank, jar, or bowl covered! Your Beta will jump and you don’t want him to end up flopping on the tabletop! Keeping the water level at least two inches from the top of the tank should also cut down on this problem. Your Betta is a meat eater and likes live foods, such as brine shrimp the best. Frozen bloodworms are also a good choice for your meat eater. Most Betta fish will happily eat the Betta pellets sold at most pet stores. For a special treat every now and again you should offer some live food! You’ll have fun watching him eat it up! Do not decorate your Betta bowl with rocks or marbles that may cause your Betta to get stuck between or under them. Be sure that they are a flat smooth surface that provides no risk to the health of your fish. Remember that your fish is a living, breathing responsibility. You need to feed, clean, and care for your Betta just like you would any other pet. If he’s sick take him to the vet, if he’s hungry feed him, if his home is dirty, clean it. That’s it! These ten tips for caring for your Betta fish will have you well on your way to keeping a healthy fish. Internet Betta Groups or library books can be a great source of information should you want to learn more about your finned friend!